…set the standard of excellence in academic midwifery education with the original midwifery home study course. …offers the most unique program, the most comprehensive and applicable curriculum, and the best value in midwifery education. …honors the midwife of yesterday, supports the midwife of today, and holds the door open for the midwife of tomorrow. …need direction to get started. …want a solid academic foundation before beginning an apprenticeship. …prefer home-based study over attending midwifery schools. …are competing for apprenticeships and want to prove their desire and dedication. …and those who want to be with their young children now while preparing for an apprenticeship when their children are older. …are willing to make a major commitment to their education even if there is no official recognition from any other entity. …aren’t satisfied with minimal academic requirements. want to understand WHY as well as WHAT to do WHEN. …want a balanced program that addresses all the concerns of an apprenticeship from both sides. …understand that application is more important than memorization and that the end result of a midwifery course should be much more than a passing score on a test. …develop a ‘specialty’ area of expertise. …believe in “with woman” midwifery, which means that birth belongs to parents and that a midwife’s role is not one of birth management, but of assistance. …and those who want structured continuing education. …and those who are considering midwifery. … trust the wisdom of midwifery and respect the dignity and beauty of birth. … know there are quick and easy courses out there, but wouldn’t settle for anything less than the best. … believe that midwives should be concerned with client education and responsibility. … want a program that encourages academic debate, where students are encouraged to develop their own informed opinions, and where decision-making skills are stressed. … need help with the specifics of establishing a successful midwifery practice, including the creation of forms, policies and protocols. … acknowledge that a midwife must conscientiously prepare for all the responsibilities of the profession and work toward a very high level of personal and professional integrity and accountability. … want a course that will address relationship and counseling skills as well as problem solving, and critical thinking skills. … are convinced that they will benefit from our unusual, but effective, instructional methods that integrate all related subjects, use ‘layered’ learning, do not emphasize grades or tests, and minimize performance anxiety. … believe that their commitment to excellence will result in academic and personal growth, and ultimately, a sustaining level of confidence. … want to invest time in an educational endeavor that will pay dividends indefinitely. … value our distinction as the original program of its kind, and our thirty-two year history of helping women reach their educational goals. …are a lot like YOU! Our students are really quite a diverse group! A unique feature of our course is that it seems to work for women at any stage of experience or expertise. Some students are college graduates; some with masters or doctorates. Many have not completed high school. we have had enrollees who joined us in their late fifties and sixties. and there have been many who enrolled without having been to a single birth before starting the course. Several enrollees have some medical background, but most do not. Some have experience as apprentices, doulas, or childbirth educators, but there are just as many who don’t. Many have had home births. Some have had hospital births. Some have never given birth. and they have found it. Self-paced learning results in high competency levels in 95 percent of adult learners. AAMI students can work in any order, at any pace. Students who are ‘internally directed’ assume more responsibility for their own learning. Our emphasis is on learning rather than grades. The discipline to write down what is being learned reinforces learning in adults. Evaluation of learning required with every assignment. Students are more receptive to learning when a degree of autonomy is required. Students are encouraged to use many sources and make many choices in the curriculum. About 80 percent more will be learned from a final exam if it is ‘student corrected’. Our Progress Tests and Certification Exam are self-assessment exams. Goals are 97 percent more likely to be achieved if they can be articulated and have been written down. Accomplished with Cover Sheets, our Learning Evaluation sheets, and Annual Reports. We were the first to believe that an excellent academic midwifery education could be achieved through a correspondence course. We designed a midwifery curriculum and a system that works. We are continually revising and updating, as well as incorporating innovative educational concepts into our midwifery program. More than 2,600 enrollments and 35 years have taught as a lot. There are many distinctive and outstanding features of our midwifery education program. We’ve learned where a midwifery student needs direction and where it is best for her to determine her own direction. For example, the student may submit completed sections of the course in any order that makes sense to her, she may create her own documentation system, and may choose the books she wants for the required critiques and reports. Just getting started is a challenge for many midwifery students so we provide extra help in many areas concerning organization and productivity. We give extensive instructions and assistance in several areas, such as creating topical databases. We have developed forms and checklists for many aspects of the course: reading evaluation, cover sheets for evaluation of each assignment, book reviews, video reviews, Good Science/Best Practice forms, and many more. There are many assignments and worksheets designed to help the midwifery student assess her beginning knowledge, track her progress, outline her goals, and solve her logistical problems. Some help us know more about the student so that we can be more effective in helping her through the midwifery course. We offer incentives, awards and opportunities to earn extensions, publish a regular newsletter, and provide daily assistance via e-mail. Our Online Midwifery Study Group is a terrific source of support. We place great emphasis on meticulous documentation. We teach several unique organizational methods to ensure that the student’s midwifery education investment pays long-term dividends. Our theory is that unless the work is retrievable and revisable it is no more than ‘busy work’. We aren’t interested in keeping the student busy; we are interested in helping her create a comprehensive, well-researched and documented resource that will serve her indefinitely. As our midwifery curriculum has gone through revisions, our procedures have also been carefully examined and refined. Initially we required research ‘papers’. After a few years we instituted an entirely new method of presentation which does not require writing skills, creates a lower level of anxiety for the student, and is actually a much more efficient means of proving the extent of knowledge on each topic. We designed a reading evaluation system which helps the student document and evaluate printed matter without having to spend a lot of time writing book reviews. Because workshop and conference attendance is just not possible for many students, we initiated evaluation of approved conference tapes. And you thought it was just a midwifery course!!!! Our founder Carla’s grandmother, Minnie Stigall Tomlinson Warner, never had to fight a ‘system’. She never found herself in a political battle because of her profession and she was never the subject of an investigation or ridicule from the medical community. To the contrary, Carla’s grandmother was a highly respected practitioner. Many times doctors knocked on her door to ask if she would accompany them to a birth that was expected to be difficult. 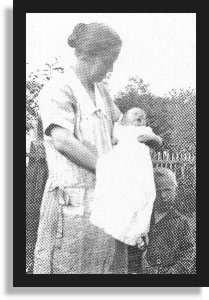 According to family legend, “Grandma” possessed a particular gift for reviving ‘blue babies’ and was credited with bringing many babies ‘back’ that a doctor had considered dead. In those days, she was revered as a healer and considered an authority in everything that had to do with birth and children. The traditional wisdom of the midwives of Carla’s grandmother’s time is no longer enough. Contemporary midwives face a number of new challenges that require an academic advantage. Normal birth is not definable in medical terms. Childbirth is ‘treated’ as a disease and pregnant women are prodded through a technical, medicalized system that actually creates complications in an over-zealous attempt to predict or prevent them. The practice of midwifery is no longer respected as a traditional and vital community service. The medical community generally misjudges and disapproves of midwives. Midwives often find themselves defending their profession in the medical community and in the political arena. Society, in general, is misinformed about birth and midwifery, and there are many potential legal jeopardies Carla’s grandmother never had to contemplate. There is a lot to learn. There is a lot to know. In-depth academic study is an absolute requirement. Our theory is that a midwife who ‘knows’ a lot is much more comfortable doing less. The kind of midwifery educational assistance we want to offer is true ‘with woman’, ‘sit on your hands,’ ‘assist; not ‘manage’ style midwifery. * participating in our online study group for inspiration, updates, and help from staff and fellow students. * participate in frequent conference calls & teleconferences. * subscribe to our monthly ACCESS newsletter. *subscribe to our monthly Class Notes newsletter. * have the opportunity to qualify for our quarterly Honor Roll. * volunteer to ‘teach’ a Truth Teller’s Conference Call on any topic within her expertise. * enroll in Intensive Study courses. * complete topical Intensive Study Modules. * participate in the NARM FOCUS program and have a CPM Tutor. studies that show homebirth is safe! Midwifery is unlike medicine in practice, philosophy and educational process. Midwives should never consider adopting medicine’s educational system unless we are prepared to accept the sacrifices we would make in practice – and unless we are ready to adopt a new philosophy. The educational differences in midwifery and medicine are best exemplified by the fact that midwifery has been traditionally learned through apprenticeship; medicine has completely overlooked the validity of that route. Medicine operates as one huge tree with many branches. Midwives, by necessity, are more like individual trees, rooted in tradition, nurtured by the rewards of their work which are subject to individual definition. Midwives often stand together as a grove of trees, but they respect the individuality of each tree. Midwives also extend themselves to shelter little trees (apprentices) as they grow. That growth process is called the apprenticeship. Our faculty and staff are here to help you. We are in the process of restructuring and not everyone’s roles have been updated. If you have a question, email the person you need to talk to and they’ll do their best to help.